Baka to Test to Shoukanjuu Wallpaper: Be happy even if you are a baka. 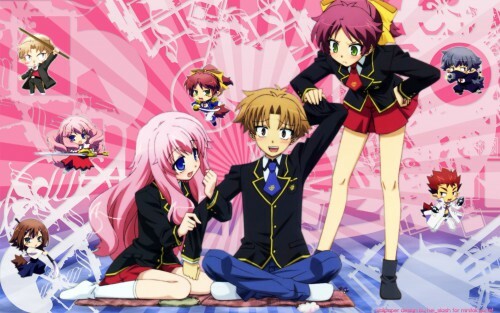 Minitokyo »	Baka to Test to Shoukanjuu Wallpapers » Baka to Test to Shoukanjuu Wallpaper: Be happy even if you are a baka. Well, this is my first wallpaper, I don`t know why but somehow I`m really enjoying this serie and I thought why not make a wall and here it`s is. Now i`m working on improving my skills `cause my goal is to have one of my walls became an Elite here in Minitokyo so I`ll really work hard to it. whithout them I wouldn`t be able to make my first wall. Oh yay I love the finished look. I also like how you positioned the stripes to where they go in a circle to where you focus on all of the wall. This is very good for a first wall I would be very proud if I was you. And I also hope you get better to where you get into the Elite gallery..*smiles*. very nice! thanks for the up! 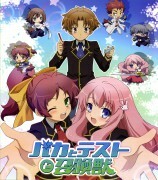 baka to test to shokanjuu was a comedy genre anime! good work! it's nice. continue! Great job, great quality, nice fitting of the chibi forms into the circles and shapes. Solid and nice for your first wall! Congrats.